Unfortunately, disappointment is a part of life. It can also be a major part of family law cases. Most often in a family law case, someone is going through just about the most difficult thing they do as an adult when dealing with a divorce/custody matter. Either they have done something, or their spouse has, which has caused significant upheaval, loss of trust and despair A large part of family law includes helping someone cope with those feelings and emotions. While there is no easy answer on how to cope, there are a number of things that can be done to promote healing. Seek Counseling. I recommend counseling to almost every client. This is NOT because I think something is wrong with them. It is because Counselors are people who have expertise in dealing with persons going through emotional crisis. A lawyer can deal with a legal crisis, and some are good at the emotional issues too, but all are not. A counselor can help and they have often heard and dealt with a similar circumstance. Counseling can be with a licensed counselor, a religious leader or a sage friend with experience. Keep a Routine. Keeping a routine can help more than you think. A recent study showed that persons who made their bed each morning were more organized and felt better about themselves throughout the day. This routine made their day better. This is something easy to do and it only takes 2 minutes, but can make a difference in how you feel. I encourage my clients to get in a routine and keep it. I encourage them to continue their exercise regimen or start one. Let’s Go Walking (a la Haley Barbour!). I also encourage them to eat the right stuff. While this may sound dumb or not my business – a family law matter concerns mind, body, and spirit. Disappointment is a part of life and, seemingly, a large part of family law. Effectively dealing with the “bumps” in the road will help you get back on track. The proper way to tie a Bow Tie. Tie a basic overhand knot (right over left) and pull the knot to the center of your shirt neck. Fold the right side of the bow so that the “left bow” is doubled and the “right bow” is a single layer. The fold on the “left bow” becomes the far edge of the bow tie. Place the center of the bow on the knot in the center of the shirt neck. Pull the left side of the bow over the middle of the bow and knot. Hanging straight down. Snap the bow closed and hold the bow in place. Lightly pull the closed bow to reveal a small hole behind the bow, but in front of the knot. Fold the left side, which is now the “back bow” while pushing the “back right bow” through the small hole. Once through, pull the front left bow and back right bow to straighten and tighten the bow tie. It does not have to look perfect, and a little imperfection can be “on purpose” because you tied it yourself. The clever title to this blog was proposed by an attorney friend of mine that handles some family law matters, but practices extensively in other areas of law. We were discussing what gets them off track. The parties, after getting over the initial shock of divorce, decide they will be adults and agree. They think they can agree to the divorce and resolve their differences. After all, they did manage to get along for 9 years, have two kids and bought a house. What could go wrong? Perhaps they searched online and looked at divorceyourself.com. A very risky idea! Well, the old adage that the devil is in the details is never truer than in divorce. The No Fault idea gets derailed when the fellow realizes he will have to pay 20% of his income towards child support, plus health insurance and alimony. Yikes! He realizes it’s cheaper to keep her. (sorry for the cliché) The wife gets squirrely when she realizes that her half of the retirement account is consumed by balancing the equity in the house, or that the money she gets cannot be realized without significant tax consequences. Parties to a divorce don’t realize child support is until 21, not 18 in Mississippi. They don’t know the types of custody, or what that means. They agree to things that they cannot legally agree to and fail to consider the consequences. They agree to “legal terms” that do not exist in Mississippi law, because they saw it online. And lastly, one of them is finally convinced to see an attorney by a close friend or family member and when they do and realize the consequences of what they were about to do and back out, the other side becomes angry and backs out too. All of a sudden an easy deal becomes complicated, expensive and adversarial. Want to keep your situation from going from No Fault to Yo’ Fault? Do your homework, have an assessment with an attorney that practices family law, keep the peace, and be smart. 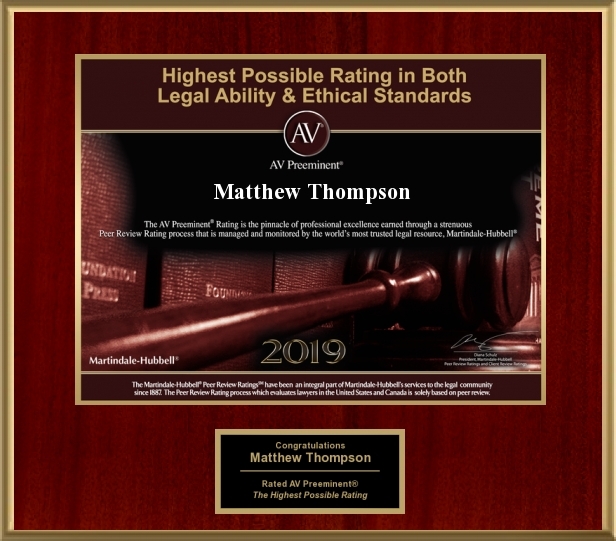 Matthew Thompson is a family law attorney that can handle your divorce whether it’s your fault, their fault, or somebody else’s. Trust the Bow Tie.